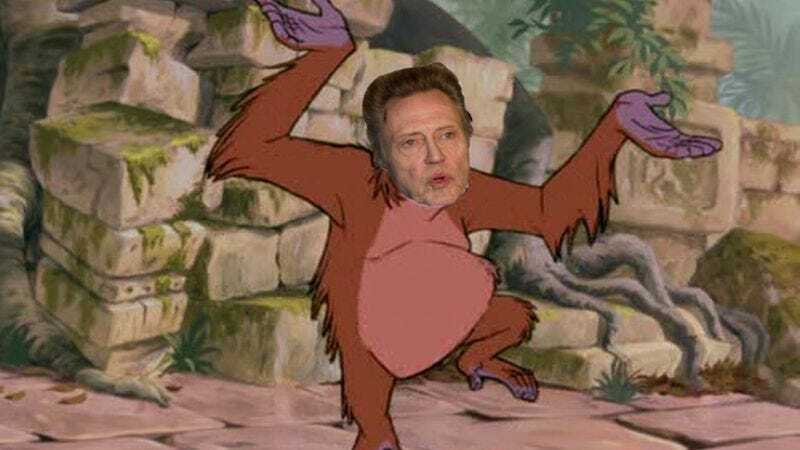 Sensing that its new, more realistic take on The Jungle Book could still use a touch of escapist fantasy, Disney has solicited the services of Christopher Walken, in what will be his first portrayal of a recognizable member of the animal kingdom. Walken will play King Louie, the monkey ruler who doesn’t actually exist in Rudyard Kipling’s original stories, but was added to Disney’s 1967 animated version after concerns arose that it didn’t feature any characters who could appear in essays on racist portrayals in children’s cartoons. There he was voiced by singer Louis Prima primarily for the dance number, “I Wanna Be Like You.” Though, as the Jon Favreau-directed film isn’t expected to take a similar musical comedy approach, it’s likely Christopher Walken’s King Louie will just tell Mowgli of the difficulties of being an orangutan, in a monologue of unnervingly graphic detail. Also joining the cast is Giancarlo Esposito, taking a respite from being dangerous and cunning in shows like Breaking Bad and Revolutions to play a nice, friendly wolf for a change. Esposito’s Akela is the leader of the wolf pack that helps to raise Mowgli—a character who was given short shrift in the original Disney version, wanting to get Mowgli into the paws of a bear as quickly as possible, as is the hope for all orphans. Walken and Esposito join an impressive voice cast that includes Ben Kingsley, Scarlett Johansson, Lupita Nyong’o, and Idris Elba. Presuming that producers are now looking exclusively at the cast members of King Of New York, the role of Baloo should go to Laurence Fishburne or David Caruso any day now.